I have an official bucket list, on which are 101 items. I was quite certain "make homemade croissants" was somewhere on that list; seems I forgot to put it up there alongside "take a hundred dollars in pennies out of the bank, walk through them, then return them." But if "homemade croissants" never made it actually on the three-page-long list taped to my bedroom wall, they were definitely on my mental list for the next time I had more than a day off of work in a row. When my boss heard I'd tackled homemade croissants, her reaction was more akin to, "What's wrong with a $2 can of Pillsbury?" 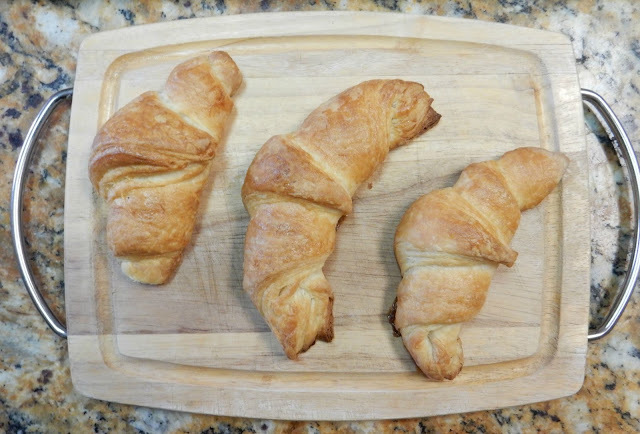 and though by the time I was done with the intricate dance of letter-folding the dough a million times I was fairly certain "croissant" was polite French for "colicky infant," the reward of splitting open my own croissant, made from scratch, was so worth the trouble. The smell of lightly salted butter and fresh yeast encases a real, handmade croissant like an alluring halo of authenticity. Its color ranges from warm brown to a golden yellow — a palette only possible when eggs are mixed with white fours and real, pale yellow butter. As you might expect, real croissants are made by hand in small batches — part of the morning process for bakers around France and other pastry-centric countries such as Austria, where the croissant originated. 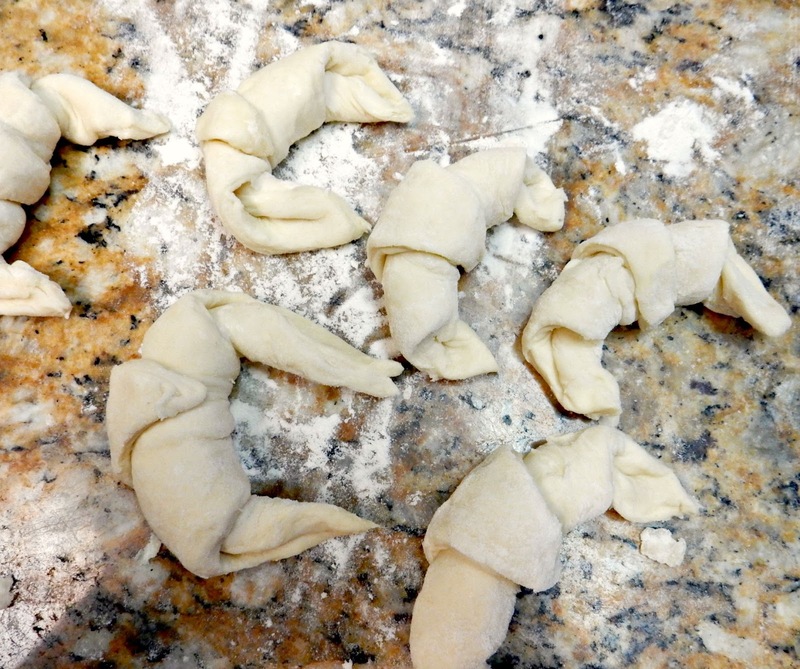 I read through the recipe carefully and was rather glad I did, otherwise I might not have realized that, um, you kind of have to do a lot of baby-sitting with croissant dough. Please, please, please always read recipes through to the end. Julia Child said so, and I've gotten in a world of trouble a time or two for obstinately refusing to. There are instructions to this baby. Read it through and all will be well. Truly. 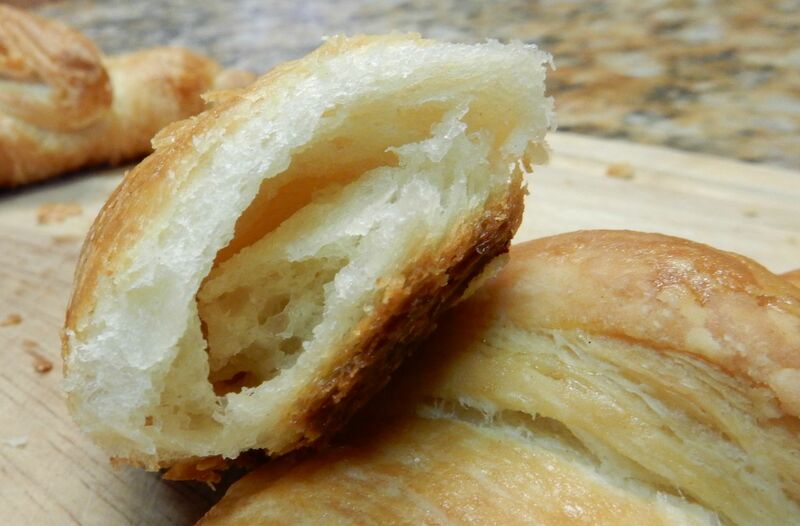 Croissants are a darn lot of work, but it isn't hard work. The finished croissant looks, to quote one of my wards, "like a proud walrus." And I'm giving you the recipe, because though I might not share the finished product (MINE! ), I don't mind you making some of your own. 1. 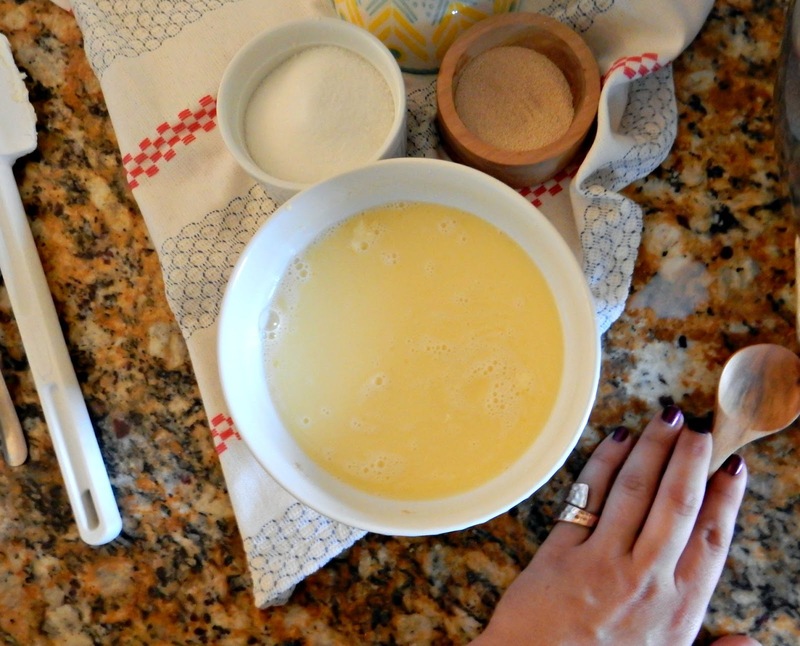 Divide the butter: two sticks in one group, setting aside the remainder. Between two sheets of plastic wrap, roll/pat/mold the two sticks of butter into a thin, flat square (about 8"x8"). 2. Scald the milk and allow to cool slightly. 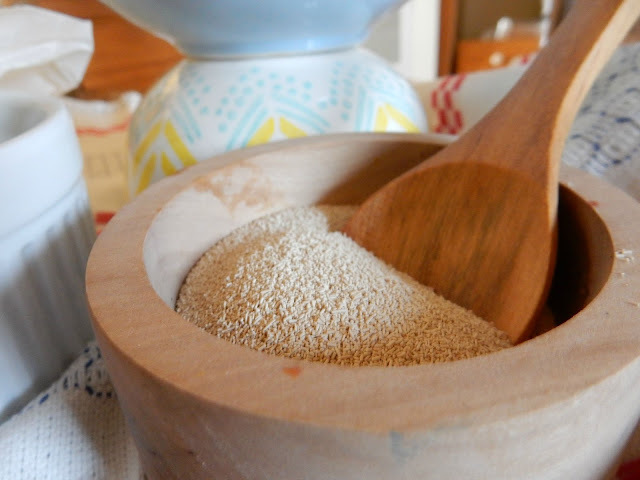 When cooled, but still warm, pour into small bowl and sprinkle with yeast, whisking till well-mixed. Add the sugar and remaining 3 tablespoons of butter and the salt. Add in the bread flour, sprinkling in a quarter cup at a time. 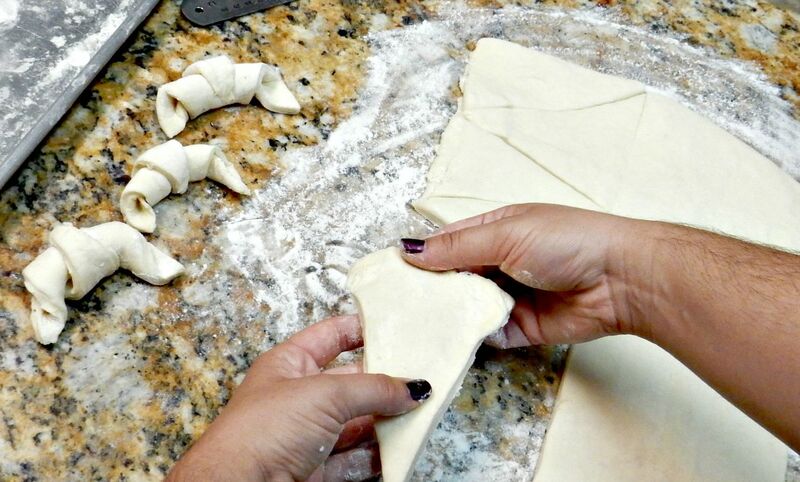 Mix with wooden spoon until all the flour is incorporated and you have made a smooth, soft dough. 3. 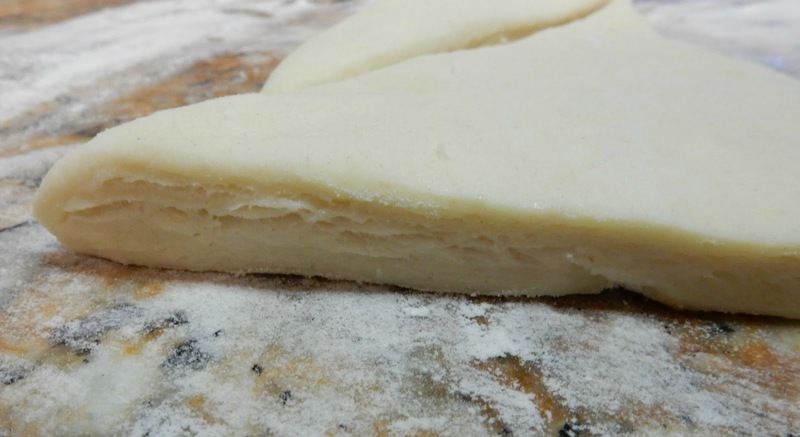 Shape into large rectangle (about the size of a large cookie sheet) on floured cookie sheet and allow to rest in fridge for 20 minutes. 4. After the dough has chilled, remove from fridge. 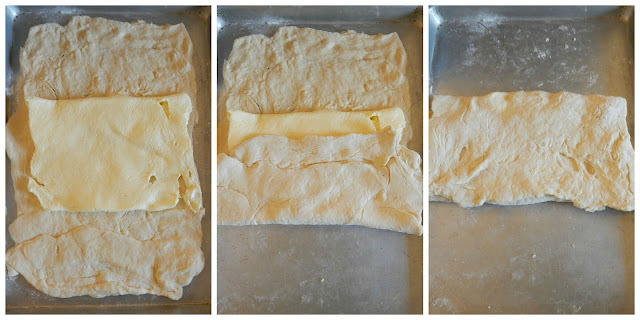 Place the "butter block" in the center of the dough and fold dough over it as you would fold a business letter (see photos above). With a rolling pin, roll back out into rectangle shape. Return to fridge and allow to rest another 20 minutes. 5. Dust your workspace and repeat this folding, rolling, resting process three more times. 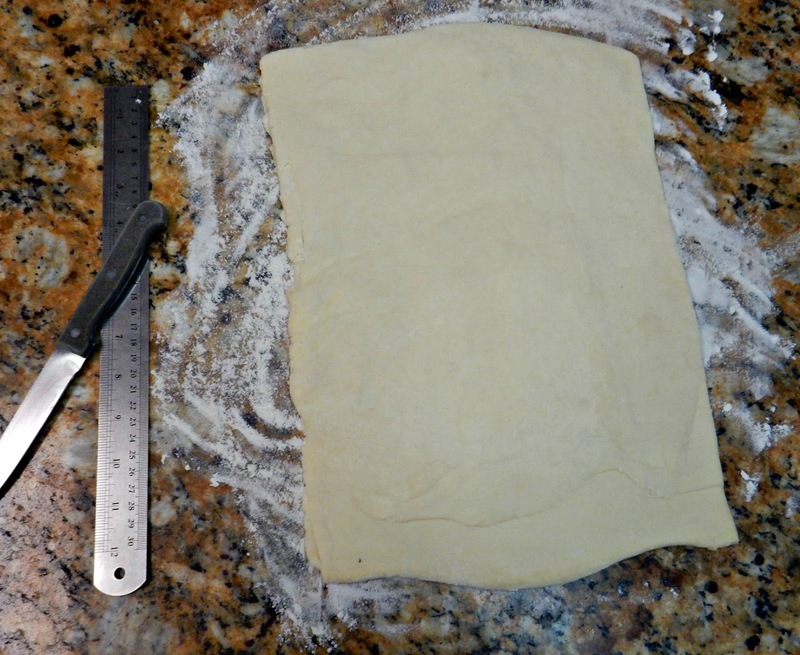 Finally, use a ruler and measure off triangular pieces of dough. The original recipe called to cut the dough into 10 pieces, but I found that, making triangles of a smaller size gave me at least 18 croissants, which was much happier a discovery than 10. 6. 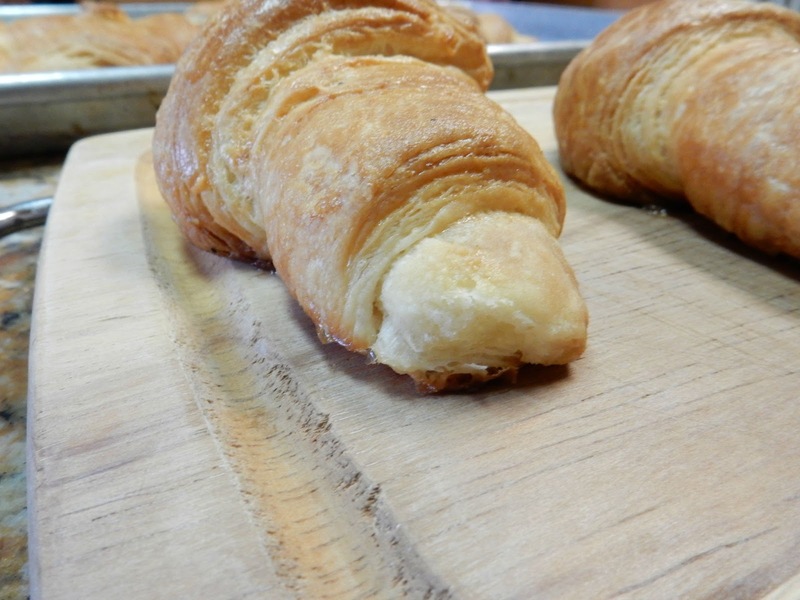 Roll your croissants, beginning with the wide end and ending with the pointed tip. Curl the end inward to make the classic crescent shape. Arrange on ungreased baking sheet. 7. Allow to "proof" or rise in a warm, moist place for about an hour. Preheat oven to 400 degrees Fahrenheit, brush croissants with an egg-wash, and bake for about 25 minutes or until, in Susie Norris' beautiful words, "all the shades of golden brown imaginable have developed." 8. Take croissants and yourself to someplace secluded and comfy and consume in solitude. Or, you know, share. uh, YUM!! darn, now I'm hungry again! :) How long did these take from start to finish? Wow, those are gorgeous. Homemade is always best, I think.